Deal or No Deal Fansite Forum - DoND • View topic - Deal or No Deal: 2014 Edition! Deal or No Deal: 2014 Edition! Posted: Sun Jul 27, 2014 3:16 pm Author: Aaron Brock Post subject: Deal or No Deal: 2014 Edition! I've finally finished a publishable version of my 2014 DoND game! Some in-game sounds (with more possibly to be added in the future). Last edited by Aaron Brock on Mon Jul 28, 2014 5:20 pm, edited 2 times in total. Posted: Mon Jul 28, 2014 2:54 pm Author: Aaron Brock Post subject: Re: Deal or No Deal: 2014 Edition! This one will actually load this time, oops! Couple of extra sounds for good measure! Last edited by Aaron Brock on Sat Sep 06, 2014 6:35 pm, edited 1 time in total. Posted: Wed Jul 30, 2014 12:48 pm Author: box11 Post subject: Re: Deal or No Deal: 2014 Edition! Posted: Thu Jul 31, 2014 12:55 am Author: Aaron Brock Post subject: Re: Deal or No Deal: 2014 Edition! Posted: Sat Sep 06, 2014 6:34 pm Author: Aaron Brock Post subject: Re: Deal or No Deal: 2014 Edition! + Like the one on the show, you can view a stats board showing you all the money you have ever won, how many times you've won the jackpot, 1p, the ha'penny or nothing. + Now you can play with the Summer 2014 specials Box 23, Archie's Box 23 or cfd's Box 23, as suggested here. + Swaps now guaranteed with the £250k in play. + Amount paddles are now like those of the show. 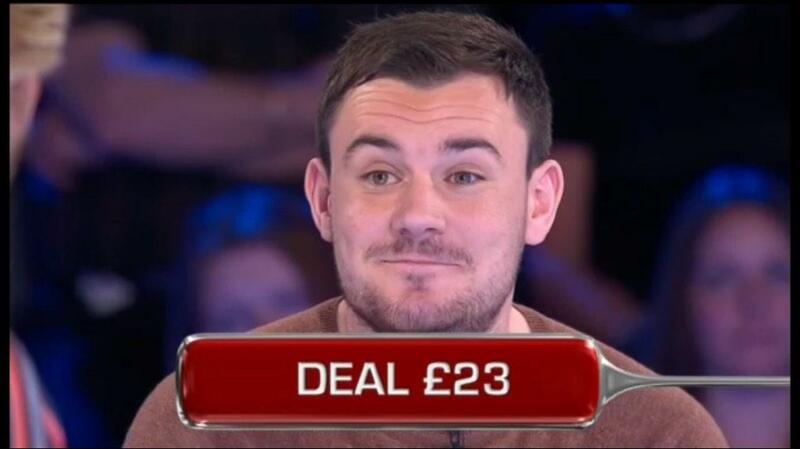 + The Banker is now more biased towards offers with "23" in (£23k, £2.3k, £230 etc). + If you have the £250k in play in the final round, you may get 4- and/or 3-box offers. If you get a 4-box offer, you will be guaranteed a 3-box offer unless the £250k goes. If you wish to, you can turn this off. + A couple more sounds for the game start up. * If Box 23 contained "Money Back" it would not show at the side. * Formula for the 2-box offer has been modified to heavily reduce AMOs, especially on finishes such as £750/£1k and £75k/£100k. * Minor (probably unnoticeable) tweaks in offer rounding. If you HAVE downloaded the game before, download THIS and extract to your C:\ folder as before. When it asks you if you want to replace the existing DoND2014.exe file, click "Yes". If you HAVE NOT downloaded the game before, download THIS and extract to your C:\ folder. Do contact me if you have any issues! Enjoy the new features! As always, let me know if you come across any bugs or anything, or let me know about odd and unrealistic offers. Posted: Fri Sep 12, 2014 9:58 pm Author: Davao Post subject: Re: Deal or No Deal: 2014 Edition! Posted: Sat Sep 13, 2014 12:33 pm Author: Aaron Brock Post subject: Re: Deal or No Deal: 2014 Edition! Posted: Sat Sep 13, 2014 3:07 pm Author: Davao Post subject: Re: Deal or No Deal: 2014 Edition! Posted: Sat Sep 13, 2014 5:36 pm Author: American Coupon Boy Post subject: Re: Deal or No Deal: 2014 Edition! How about including an offer button? Posted: Sat Sep 13, 2014 8:39 pm Author: Aaron Brock Post subject: Re: Deal or No Deal: 2014 Edition! Once I see it in action, as I don't know how they have to earn the right to use it, then I'll definitely put that in! That could be an idea! Might be difficult to program but I'll see what I can do! Posted: Sat Sep 13, 2014 9:03 pm Author: Davao Post subject: Re: Deal or No Deal: 2014 Edition! Great when is this KP box 23 coming in to use? Posted: Sun Sep 21, 2014 7:27 pm Author: Davao Post subject: Re: Deal or No Deal: 2014 Edition! Posted: Wed Sep 24, 2014 12:21 am Author: Aaron Brock Post subject: Re: Deal or No Deal: 2014 Edition! I have recently returned to university so the next update may not be for 2 or 3 weeks! Posted: Wed Sep 24, 2014 5:39 pm Author: daniel123 Post subject: Re: Deal or No Deal: 2014 Edition! Kall can't wait that long! Come on, boy, tout de suite, tout de suite! Posted: Sun Oct 12, 2014 11:57 pm Author: Davao Post subject: Re: Deal or No Deal: 2014 Edition! Posted: Sat Oct 18, 2014 7:41 pm Author: Aaron Brock Post subject: Re: Deal or No Deal: 2014 Edition! Posted: Sat Oct 18, 2014 7:47 pm Author: Davao Post subject: Re: Deal or No Deal: 2014 Edition! Posted: Sat Oct 18, 2014 10:25 pm Author: American Coupon Boy Post subject: Re: Deal or No Deal: 2014 Edition! I just thought of a way to do that. Obviously we need a realistic range of work with as the Banker. I think the minimum offer should be 50% of the Fair Deal (as the Banker rarely makes total JOKE offers now that the offer button is in play) with a built-in floor of the minimum amount on thw board so that less than the lower amount can't be offered on close finishes. The maximum offer should be the average of the Fair Deal and the Mean of the board, so that generous offers can be made but not unrealistically generous offers. Sure, the real Banker offers the average on occasion, but from a saving money point of view it really shouldn't be offered. So, at each offer a range is generated based on the figures above, and then you can type in what you desire the offer to be as long as it is within that range. Posted: Sun Oct 19, 2014 1:24 pm Author: Aaron Brock Post subject: Re: Deal or No Deal: 2014 Edition! Hmm, I'm not sure I'd put any restraint as to what you, the Banker, could offer. I think I could just create a little pop-up box that tells you the FD and mean (maybe a couple of extra stats), then a place for you to enter your offer. Then there can be aggressive and more cautious player/computer types. I won't be making this in time for the next update, but quite possibly the one after it! Posted: Mon Nov 03, 2014 4:43 pm Author: Davao Post subject: Re: Deal or No Deal: 2014 Edition! I wonder if your adding the offer button for the next update.